PCN has offered investors a nice return since my last review. Mortgage debt continues to perform well, and that makes up the core of PCN's holdings. However, PCN's value proposition is looking less attractive, with a rising premium and declining income production in the short-term. The purpose of this article is to evaluate the PIMCO Corporate & Income Strategy Fund (NYSE:PCN) as an investment option. PCN is a fund I cover regularly and rarely recommend, but considered it a buy back in November, as its valuation had come down significantly. Since then, the fund has performed well, returning a high yield and seeing underlying asset appreciation. However, the share price move has been much higher than the NAV gain, which, while positive for current investors, has pushed up the price of ownership past the point I consider reasonable. Furthermore, income production figures are not as glamorous as they were last year, which gives me pause. 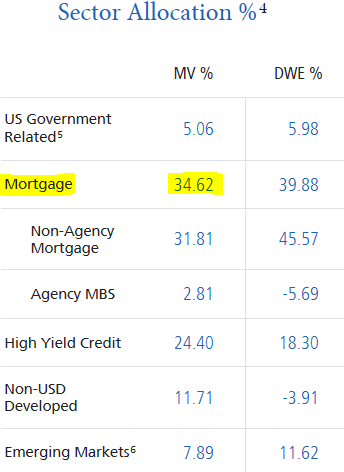 Although the underlying debt the fund holds, which is largely mortgage-related, looks set to continue its strong performance, I see little value in the current price to own the fund. I would expect patient investors will be able to pick up shares at a cheaper price in the near future. First, a little about PCN. It is a closed-end fund with a primary objective "to seek high current income, with a secondary objective of capital preservation and appreciation". Currently, the fund is trading at $16.97/share and pays a monthly distribution of $.1125/share, which translates to an annual yield of 7.96%. I was fairly optimistic on PCN when I covered it back in November, and the fund has indeed performed quite well since that time. While it dropped in December along with most of the market, the total return since that review is almost 11%, after accounting for distributions, including the special distribution of $.08/share that was announced and paid at the end of last year. While this return is attractive, I wanted to reassess PCN now that we have pushed deeper in to 2019, to see if there is still a case for buying more shares at these levels. While I have faith in the underlying holdings of the fund, I simply feel the price to buy in to PCN now is too high, and I will explain why in detail below. I will begin with a discussion on the current valuation of PCN, which is typically the reason for my caution on the fund. It has a history of trading at (what I consider) an expensive price, although the premium to NAV does fluctuate noticeably. Back in November, its 11% premium was outside my normal trading range, but I felt the price may be justified given the fund typically trades at a higher premium than that, coupled with a positive future outlook. Therefore, I was willing to recommend a double digit premium, because I felt the market environment warranted it. As you can see, PCN's premium moves in a wide range, so it is always hard to predict what its next move will be. However, there is no doubt its current price is on the upper-end of the range, and has pushed above its 1-year and year-to-date averages, which would make me very cautious at these levels. My takeaway is not that PCN is going to collapse. Rather, I simply feel potential investors would do themselves a service by holding off on new purchases and waiting for the price to come down a bit, before entering in. While there is no guarantee that will happen, the fund's history tells us there is a very good chance that it will. Another important point to consider when deciding to buy PCN is the fund's income production, as its high-yield is primarily what draws people to it. This CEF has a good history of paying its stated distribution and its income figures back in November were very strong, to the point where I felt an 11% premium was justifiable. Now, five months have passed and PCN's premium has risen, so another examination of income production is especially critical. My takeaway here is mixed. While PIMCO's UNII figures can fluctuate dramatically from month to month, seeing declines is never a positive thing. At this point, I am not concerned with PCN's ability to pay its distribution, given the fund's solid history and the fact that it does still have a positive UNII balance in reserves. However, given that the cost to own the fund has risen substantially, coupled with the trend of declining income figures, this seems like another sign we need to be cautious at these levels. Until I see either the premium decline or the income production improve (and ideally both), I would recommend holding off on purchases at this time. Now that I have discussed some of my concerns for PCN, I want to touch on one of the positive aspects on the fund - its underlying performance. Specifically, PCN has seen its NAV climb since 2019 began, to the tune of 3.4%. While this is true for many debt-focused funds, it is still a bullish sign, and has helped keep the premium to NAV climbing even higher than it already has. This should give investors confidence that the fund is invested in the right areas to take advantage of our neutral interest rate environment. Clearly, this is an area of importance for PCN and one I have been recommending for quite some time. Fortunately, it has also been a well-performing sector, as homeowners are seeing rising equity, rising wages, and lower levels of delinquencies for years. With that in mind, it is wise to consider if this is a trend that will continue going forward, or if investors should take profits and begin to rotate out of this sector. As you can see from the chart, all stages of delinquency saw declines to start off the new year, and that is a very positive sign for 2019. Looking ahead, employment and wage gains continue to be steady and sustainable, and home prices nationwide remain elevated. 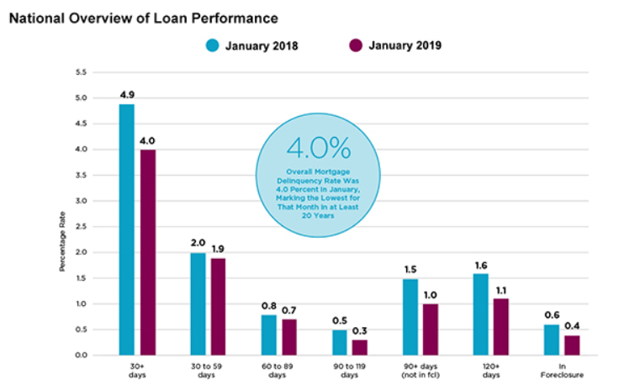 This is all a positive for mortgage debt because as home prices rise, current homeowners have additional incentive to pay off their mortgage, as they don't want to lose exposure to an appreciating asset. Furthermore, rising wages and employment figures provide the means with which to pay down that debt, helping fuel a positive cycle. My takeaway here is PCN is well positioned to see some strength in 2019. Its underlying holdings are attractive, and the fund should be able to pay its high-yield going forward. That said, PCN is not the only PIMCO CEF with this type of debt, and its above-average cost to own tells me that, while its holdings look solid, it is not enough of a differentiator to choose PCN over an alternative, and better priced, CEF. Back in November I defied my norm and recommend a fund trading at a double digit premium, as I felt PCN's shares were likely to head higher in the short-term. This turned out to be accurate, and would have handed investors a nice return. However, with this share price gain, PCN's premium has once again risen to a level I no longer find attractive. At 18%, it is simply too high for me to recommend, even more so considering the fund's average premium is noticeably lower than that level. While PCN has the right type of debt for our current macroeconomic environment, taking advantage of a strong performing mortgage sector, it is not enough to allow me to continue recommending the fund. Furthermore, its declining income production figures also give me concern, and I want to see those turn around over the next few months. Therefore, I would caution investors away from PCN at this time, and recommend they seek out better-priced alternatives with similar mortgage exposure. Disclosure: I am/we are long PCI. I wrote this article myself, and it expresses my own opinions. I am not receiving compensation for it (other than from Seeking Alpha). I have no business relationship with any company whose stock is mentioned in this article.